Desloratadine (trade name Clarinex and Aerius) is a tricyclic H1-antihistamine that is used to treat allergies. It is an active metaboliteof loratadine. It was patented in 1984 and came into medical use in 2001. Desloratadine is used to treat allergic rhinitis, nasal congestion and chronic idiopathic urticaria (hives). It is the major metabolite of loratadine and the two drugs are similar in safety and effectiveness. Desloratadine is available in many dosage forms and under many trade names worldwide. 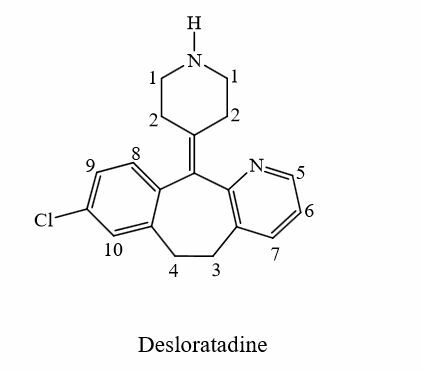 Desloratadine is a selective H1–antihistamine which functions as an inverse agonist at the histamine H1 receptor. Desloratadine is metabolized to 3-hydroxydesloratadine in a three-step sequence in normal metabolizers. 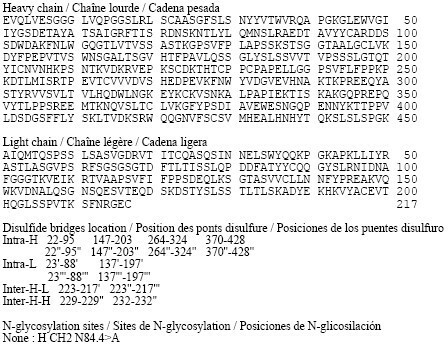 First, n-glucuronidation of desloratadine by UGT2B10; then, 3-hydroxylation of desloratadine N-glucuronide by CYP2C8; and finally, a non-enzymatic deconjugation of 3-hydroxydesloratadine N-glucuronide. Both desloratadine and 3-hydroxydesloratadine are eliminated via urine and feces with a half-life of 27 hours in normal metabolizers. It exhibits only peripheral activity since it does not readily cross the blood-brain barrier; hence, it does not normally cause drowsiness because it does not readily enter the central nervous system. Desloratadine does not have a strong effect on a number of tested enzymes in the cytochrome P450 system. It was found to weakly inhibit CYP2B6, CYP2D6, and CYP3A4/CYP3A5, and not to inhibit CYP1A2, CYP2C8, CYP2C9, or CYP2C19. Desloratadine was found to be a potent and relatively selective inhibitor of UGT2B10, a weak to moderate inhibitor of UGT2B17, UGT1A10, and UGT2B4, and not to inhibit UGT1A1, UGT1A3, UGT1A4, UGT1A6, UGT1A9, UGT2B7, UGT2B15, UGT1A7, and UGT1A8. 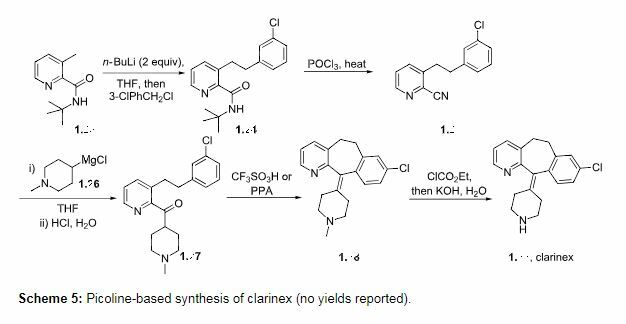 The value of substituted 3-picoline precursors is illustrated in the synthesis of clarinex (1.22, Desloratadine, Scheme 5), a dual antagonist of platelet activating factor (PAF) and of histamine used in the treatment of allergies. This compound consists of a highly functional tricyclic core with an unsaturated linkage to a pendant piperidine ring. The picoline derivative 1.23 is first treated with two equivalents of n-butyllithium (n-BuLi) followed by alkylation with benzyl chloride to give the chain elongated adduct . The tert-butylamide 1.24 is then dehydrated with phosphorous oxychloride at elevated temperatures to yield the nitrile derivative 1.25. Introduction of the piperidine ring is achieved by utilisation of the appropriately substituted Grignard reagent 1.26. A Friedel–Crafts type acylation promoted by either triflic acid or polyphosphoric acid (PPA) furnishes the tricyclic structure 1.28 which upon N-demethylation affords clarinex (1.22). Alcoholysis of 3-methylpyridine-2-carbonitrile (I) with hot tert-butanol and H2SO4 gives the N-tert-butylcarboxamide (II), which is alkylated with 3-chlorobenzyl chloride (III) and BuLi in THF, yielding N-tert-butyl-3-[2-(3-chlorophenyl)ethyl]pyridine-2-carboxamide (IV). The reaction of (IV) with refluxing POCl3 and then with NaOH affords the corresponding nitrile (V), which is condensed with 1-methylpiperidin-4-ylmagnesium chloride (VI) in THF to give the ketone (VII). Cyclization of (VII) by means of either BF3 in HF or trifluoromethanesulfonic acid yields 8-chloro-11-(1-methylpiperidin-4-ylidene)-6,11-dihydro-5H-benzo[5,6]cyclohepta[1,2-b]pyridine (VIII), which is reacted with cyanogen bromide in benzene to give the N-cyano compound (IX). Finally, this compound is treated with HCl in refluxing acetic acid/water. Alternatively, 8-chloro-11-(1-methylpiperidin-4-ylidene)-6,11-dihydro-5H-benzo[5,6]cyclohepta[1,2-b]pyridine (VIII) is treated with ethyl chloroformate in hot toluene, affording the carbamate (X) (2), which is finally decarboxylated with KOH or NaOH in refluxing ethanol/water. Condensation of ethyl nicotinate (XI) with 3-chlorophenylacetonitrile (XII) by means of sodium ethoxide in ethanol gives 2-(3-chlorophenyl)-3-oxo-3-(3-pyridyl)propionitrile (XIII), which by refluxing with concentrated HBr yields 2-(3-chlorophenyl)-1-(3-pyridyl)ethanone (XIV). The reduction of (XIV) with hydrazine hydrate and NaOH in diethylene glycol at 235-40 C affords 3-(2-phenylethyl) pyridine (XV), which is oxidized with H2O2 in hot acetic acid to provide the corresponding N-oxide (XVI). Reaction of (XVI) with NaCN and dimethyl sulfate in water affords the previously described 3-(2-phenylethyl)pyridine-2-carbonitrile (V), which can be worked up as previously described or cyclized with polyphosphoric acid (PPA) at 180 C to give 8-chloro-6,11-dihydro-5H-benzo[5,6]cyclohepta[1,2-b]pyridin-11-one (XVII). 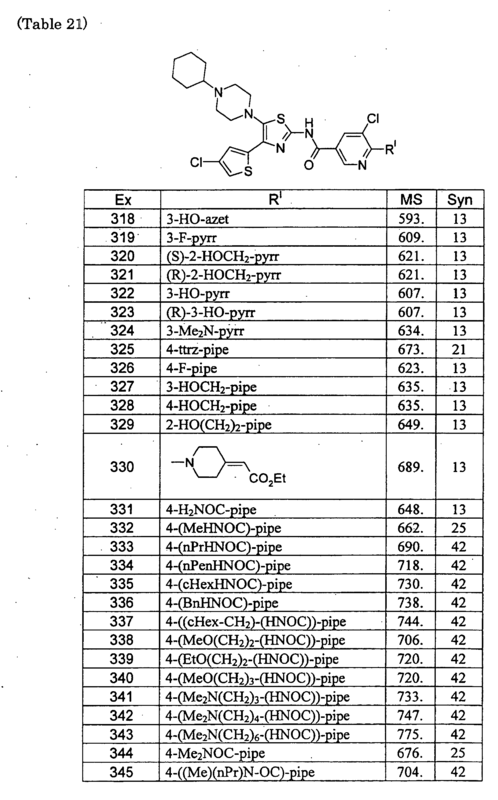 The condensation of (XVII) with 1-methylpiperidin-4-ylmagnesium chloride (VI) in THF yields the corresponding carbinol (XVIII), which is dehydrated with PPA at 170 C to afford the previously reported 8-chloro-11-(1-methylpiperidin-4-ylidene)-6,11-dihydro-5H-benzo[5,6]cyclohepta[1,2-b]pyridine (VIII). 2) By reaction of 8-chloro-6,11-dihydro-5H-benzo[5,6]cyclohepta[1,2-b]pyridin-11-one (III) with the Grignard reagent (IV) to give the tertiary carbinol (V), which is dehydrated with 85% H2SO4 affording 8-chloro-11-piperidinylidene derivative (VI). Finally, cornpound (VI) is treated with ethyl chloroformate (II) in toluene. 1) By carboxylation of 8-chloro-6,11-dihydro-11-(4-piperidylidene)-5H-benzo[5,6]cyctohepta[1,2-b]pyridine (I) with ethyl chloroformate (II) in refluxing benzene. The condensation of S-methylisothiourea (I) with trans-4-(aminomethyl)cyclohexanecarboxylic acid (II) by means of NaOH in water gives trans-4-(guanidinomethyl)cyclohexanecarboxylic acid (III) (I), which is esterified with benzyl salicylate (IV) by means of dicyclohexylcarbodiimide (DCC) or SOCl2 yielding 2-benzyloxycarbonylphenyl trans-4-(guanidinomethyl)cyclohexanecarboxylate (V). Finally, this compound is treated with cyclodextrin in aqueous solution to afford the corresponding complex. 2: 4, and desloratadine structure match. 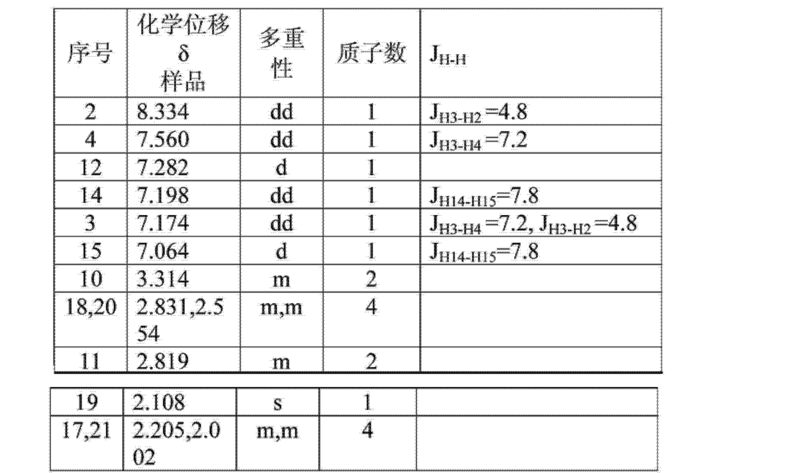 (4) δ 7.282 处 doublet hydrogen as a group, the number of protons is I, 12 attributed to hydrogen. 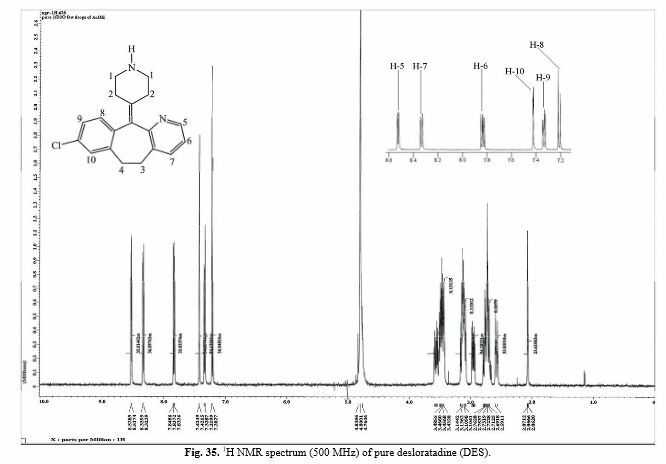 (12) δ 2.205, 2.002 处 two hydrogen multiplet, protons of 4, 17, 21 bits attributed to hydrogen;  From the foregoing, 1H-NMR spectrum data and the resulting product in this embodiment is of he will be loratadine same structure as the target product. ^ Fischer, Jnos; Ganellin, C. Robin (2006). Analogue-based Drug Discovery. John Wiley & Sons. p. 549. ISBN 9783527607495. ^ Jump up to:a b c See S (2003). “Desloratadine for allergic rhinitis”. Am Fam Physician. 68 (10): 2015–6. PMID 14655812. ^ Lee HE, Chang IK, Lee Y, Kim CD, Seo YJ, Lee JH, Im M (2014). “Effect of antihistamine as an adjuvant treatment of isotretinoin in acne: a randomized, controlled comparative study”. J Eur Acad Dermatol Venereol. 28 (12): 1654–60. doi:10.1111/jdv.12403. PMID 25081735. ^ Layton AM (2016). “Top Ten List of Clinical Pearls in the Treatment of Acne Vulgaris”. Dermatol Clin. 34 (2): 147–57. doi:10.1016/j.det.2015.11.008. PMID 27015774. ^ Jump up to:a b c d “Aerius: EPAR – Product Information” (PDF). European Medicines Agency. 2017-06-07. ^ Canonica GW, Blaiss M (2011). “Antihistaminic, anti-inflammatory, and antiallergic properties of the nonsedating second-generation antihistamine desloratadine: a review of the evidence”. World Allergy Organ J. 4 (2): 47–53. doi:10.1097/WOX.0b013e3182093e19. PMC 3500039. PMID 23268457. By DR ANTHONY MELVIN CRASTO Ph.D in Uncategorized on April 4, 2019 .